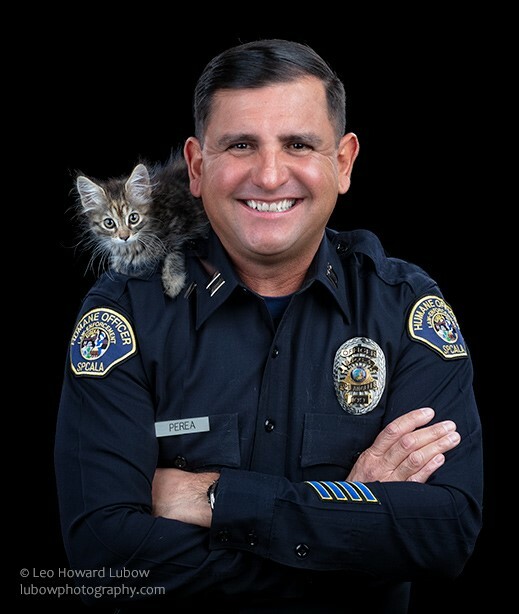 Los Angeles, CA — Society for the Prevention of Cruelty to Animals Los Angeles (spcaLA) Humane Officer, Captain Cesar Perea is featured in the 2019 “Softie Cop” Calendar. The Calendar is a collaboration between Show Your Soft Side (SYSS), a public service campaign that works to end animal cruelty, and the National Sheriffs’ Association (NSA). Proceeds of the calendar benefit SYSS’s anti-cruelty campaign and initiatives. Captain Cesar Perea. Photo by Leo Howard Lubow. The calendar features images by photographers Leo Howard Lubow and Virgil Ocampo of 17 officers from Washington D.C., Texas, Ohio, Pennsylvania, and of course, Los Angeles. Calendars are available at www.sheriffs.org/ShowYourSoftSide.